Are you a Foursquare fanatic in the Philippines? Then I’ve got Brilliant News for you, if (1) you are in Manila, and (2) adore Lady Gaga. 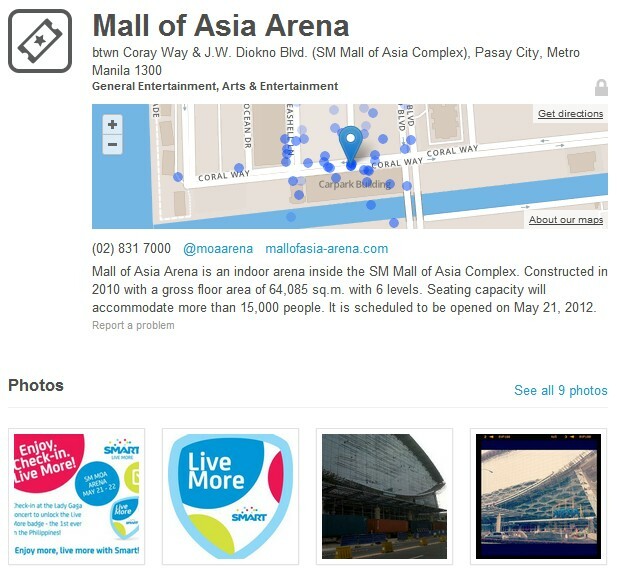 SMART is bringing the FIRST-Ever Foursquare Badge in the country called the SMART #LiveMore Badge. This badge can be UNLOCKED by checking in at Lady Gaga‘s Born This Way Ball at the Mall of Asia Arena on May 21 (Mon) and May 22 (Tue) 6PM – 2AM. While this may NOT be a Country- or a City-specific badge tourist-wise, I hope this SMART #LiveMore Badge will pave the way for those opportunities in the future. With more businesses like Bo’s Coffee and SMART making use of Foursquare, it just might be possible for Philippines to earn its City badges! This news was brought to you through @4sqPhilippines. FOLLOW them on Facebook and Twitter. For MORE INFO about Lady Gaga’s concert, read this. For SMART’s Foursquare badge and RAFFLE, read this. While we’re on the topic of Foursquare, I have just recently been PROMOTED to Super User Level 2. If you are an SU in Cebu, please reach out me, so we can organize events! You can also follow @SUPhilippines to get in touch with other SUs in the country.